SharePoint 2010 BCS Mailbox connector for Microsoft Exchange empowers you search private mailboxes via SharePoint and FAST Search. Preview Exchange emails and attachments directly from search user interface via SharePoint Business Connectivity services. Microsoft provides Exchange OOB connector for SharePoint 2010 search and FAST Search for SharePoint. Unfortunately this connector limited to Exchange public folder only. 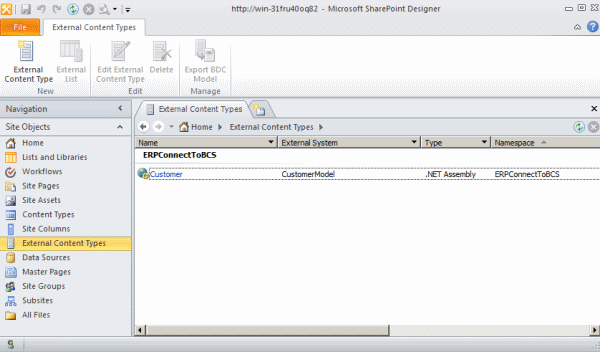 One of the core concepts of Business Connectivity Services (BCS) for SharePoint 2010 are the external content types. They are reusable metadata descriptions of connectivity information and behaviours (stereotyped operations) applied to external data. SharePoint offers developers several ways to create external content types and integrate them into the platform. The SharePoint Designer 2010, for instance, allows you to create and manage external content types that are stored in supported external systems. Such an external system could be SQL Server, WCF Data Service, or a .NET Assembly Connector. 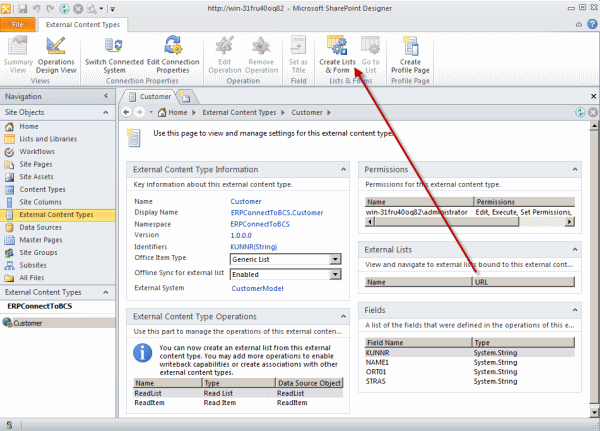 This article shows you how to create an external content type for SharePoint named Customer based on given SAP customer data. The definition of the content type will be provided as a .NET assembly, and the data are displayed in an external list in SharePoint. The SAP customer data are retrieved from the function module SD_RFC_CUSTOMER_GET. In general, function modules in a SAP R/3 system are comparable with public and static C# class methods, and can be accessed from outside of SAP via RFC (Remote Function Call). Fortunately, we do not need to program RFC calls manually. We will use the very handy ERPConnect library from Theobald Software. The library includes a LINQ to SAP provider and designer that makes our lives easier. After defining the Visual Studio solution name and clicking the OK button, the project wizard will ask what kind of SharePoint 2010 solution you want to create. The solution must be deployed as a farm solution, not as a sandboxed solution. 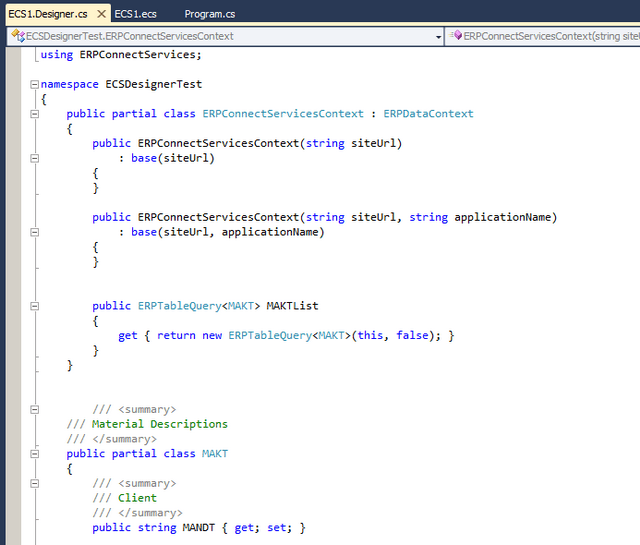 Visual Studio is now creating a new SharePoint project with a default BDC model (BdcModel1). You can also create an empty SharePoint project and add a Business Data Connectivity Model project item manually afterwards. This will also generate a new node to the Visual Studio Solution Explorer called BdcModel1. The node contains a couple of project files: The BDC model file (file extension bdcm), and the Entity1.cs and EntityService.cs class files. The dialog provides you the option to define the method name and parameters you want to use in your SAP context class. The context class is automatically generated by the LINQ to SAP designer including all SAP objects defined. Those objects are either C# (or VB.NET) class methods and/or additional object classes used by the methods. For our project, we need to select the export parameters KUNNR and NAME1 by clicking the checkboxes in the Pass column. These two parameters become our input parameters in the generated context class method named SD_RFC_CUSTOMER_GET. We also need to return the customer list for the given input selection. Therefore, we select the table parameter CUSTOMER_T on the Tables tab and change the structure name to Customer. Then, click the OK button on the dialog, and the new objects get added to the designer surface. IMPORTANT: The flag “Create Objects Outside Of Context Class” must be set to TRUE in the property editor of the LINQ designer, otherwise LINQ to SAP generates the Customer class as nested class of the SAP context class. This feature and flag is only available in LINQ to SAP for Visual Studio 2010. As you can see, we basically have just a few lines of code. All of the SAP data access logic is encapsulated within the SAP context class (see the LINQtoERP1.Designer.cs file). 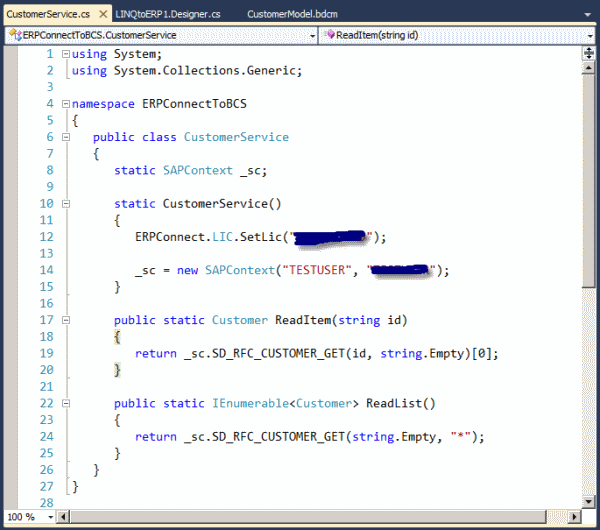 The CustomerService class just implements a static constructor to set the ERPConnect license key and to initialize the static variable _sc with the SAP credentials as well as the two BDC model methods. The ReadItem method, BCS stereotyped operation SpecificFinder, is called by BCS to fetch a specific item defined by the identifier KUNNR. In this case, we just call the SD_RFC_CUSTOMER_GET context method with the passed identifier (variable id) and return the first customer object we get from SAP. The ReadList method, BCS stereotyped operation Finder, is called by BCS to return all entities. 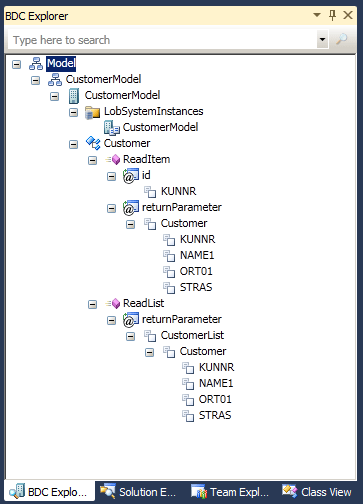 In this case, we just return all customer objects the SD_RFC_CUSTOMER_GET context method returns. The returned result is already of type IEnumerable<Customer>. The final step is to deploy the SharePoint solution. Right-click on the project node in Visual Studio Solution Explorer and select Deploy. This will install and deploy the SharePoint solution on the server. You can also debug your code by just setting a breakpoint in the CustomerService class and executing the project with F5. On this page, we find our deployed BDC model including the Customer entity. You can click on the name to retrieve more details about the entity. Right now, there is just one issue open. We need to set permissions! Mark the checkbox for our entity and click on Set Object Permissions in the Ribbon menu bar. Now, define the permissions for the users you want to allow to access the entity, and click the OK button. In the screen shown above, the user administrator has all the permissions possible. In the next and final step, we will create an external list based on our entity. To do this, we open SharePoint Designer 2010 and connect us with the SharePoint website. Click on External Content Types in the Site Objects panel to display all the content types (see above). Double click on the Customer entity to open the details. The SharePoint Designer is reading all the information available by BCS. In order to create an external list for our entity, click on Create Lists & Form on the Ribbon menu bar (see screenshot below) and enter CustomerList as the name for the external list. OK, now we are done! The external list shows all the defined fields for our entity, even though our Customer class, automatically generated by the LINQ to SAP, has more than those four fields. This means you can only display a subset of the information for your entity. Another option is to just select those fields required within the LINQ to SAP designer. With the LINQ designer, you can access not just the SAP function modules. 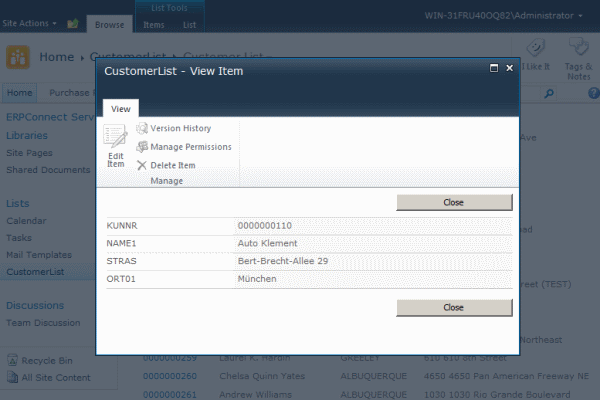 You can integrate other SAP objects, like tables, BW cubes, SAP Query, or IDOCs. 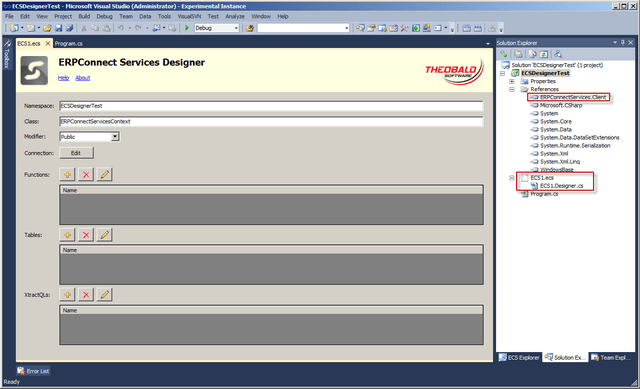 A demo version of the ERPConnect library can be downloaded from the Theobald Software homepage. This weekend was spent completing my new “List Search Web Part” and also 2 Free Web Parts that is included in the “List Web Part Pack” – More about this in my future blog. In between the “SAP Bug” bit me again and I decided to write a blog post series on the various adapters I have used in SharePoint and SAP Integration Projects and to give you a basic “run down” of how and with which technologies each adapter connects the 2 systems with. ERPConnect was 1st on the list. …. For starters, you need to have a SAP Developer Key to be allowed to use the SAP web service wizard, and also have the required SAP authorizations. In other cases it may not be allowed by IT operations to make any modification to the SAP environment, even if it’s limited to the full-automatic generation and activation of the BAPI webservice(s). Another reason from a system architecture viewpoint, is that the single BAPI and/or RFC calls may be of too low granularity. You actually want to perform a ‘business transaction’, consisting of multiple method invocations which must be treated as a Logical Unit of Work (LUW). SAP has introduced the concept of SAP Enterprise Services for this, and has delivered a first set of them. This is by far not complete yet, and SAP will augment it the coming years. 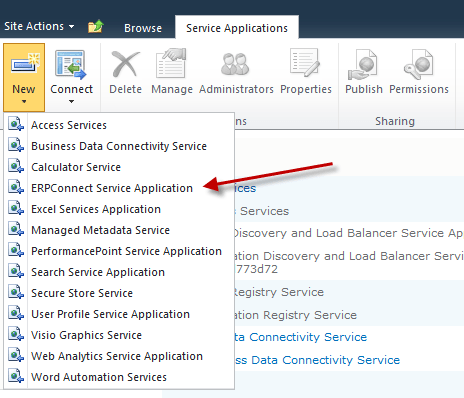 Another and way more flexible option to use SAP data in SharePoint are the ERPConnect Services for SharePoint 2010 (ECS). The product suite consists of three product components: ERPConnect Services runtime, the BCS Connector application and the Xtract PPS for PerformancePoint Services. The runtime is providing a Service Application that integrates itself with the new service architecture of SharePoint 2010. The runtime offers a secure middle-tier layer to integrate different kind of SAP objects in your SharePoint applications, like tables and function modules. 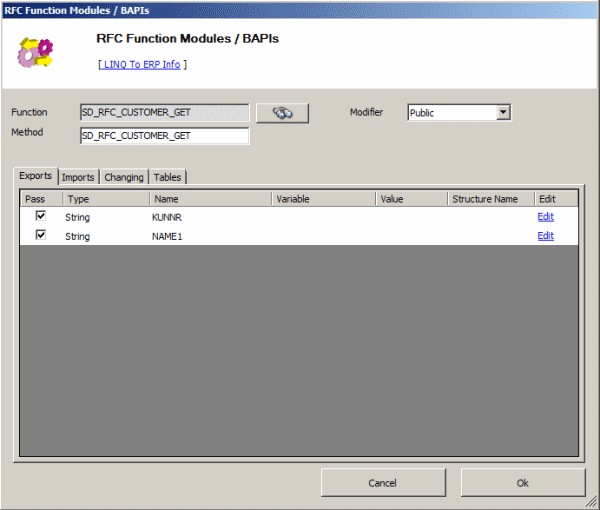 The BCS Connector application allows developers to create BDC models for the BCS Services, without programming knowledge. 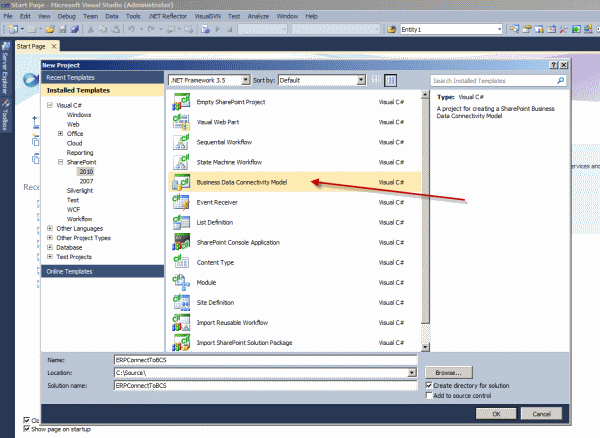 You may export the BDC models created by the BCS Connector to Visual Studio 2010 for further customizing. his article gives you an overview of the ERPConnect Services runtime and shows how you can create and incorporate business data from SAP in different SharePoint application types, like Web Parts, Application Pages or Silverlight modules. This article does not introduce the other components. 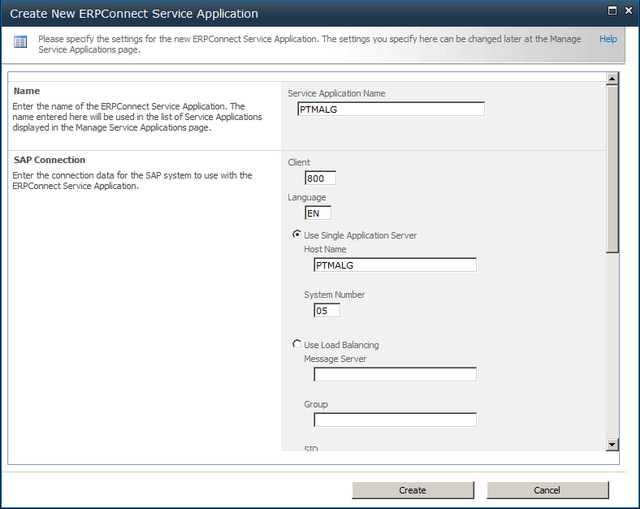 This section will give you a short explanation and background of SAP objects that can be used in ERPConnect Services. The most important objects are SAP tables and function modules. A function module is basically similar to a normal procedure in conventional programming languages. Function modules are written in ABAP, the SAP programming language, and are accessible from any other programs within a SAP system. They accept import and export parameters as well as other kind of special parameters. In addition, BAPIs (Business-API) are special function modules that are organized within the SAP Business Object Repository. In order to use function modules with the runtime they must be marked as Remote (RFC). SAP table data can also be retrieved. Tables in SAP are basically relational database tables. Others SAP objects like BW Cubes or SAP Queries can be accessed via the XtractQL query language (see below). Installing ERPConnect Services on a SharePoint 2010 server is done by an installer and is straight forward. The SharePoint Administration Service must run on the local server (see Windows Services). 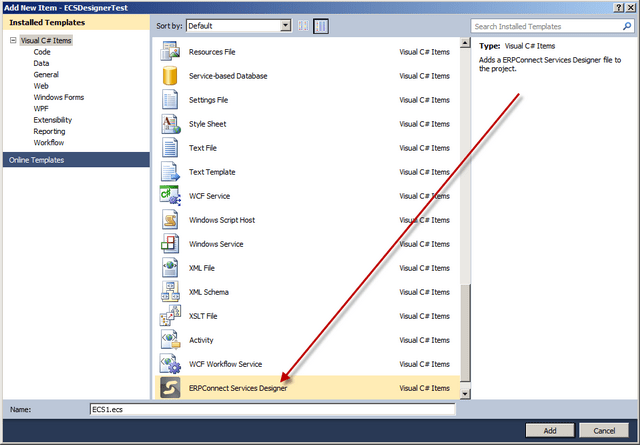 The next sections shows how to use these service and function areas and access different SAP objects from within your custom SharePoint applications using the ERPConnect Services. The runtime can be used in applications within the SharePoint context like Web Parts or Application Pages. For more details on using ECS in Silverlight or desktop applications see the specific sections below. Querying and retrieving table data is a common task for developers. 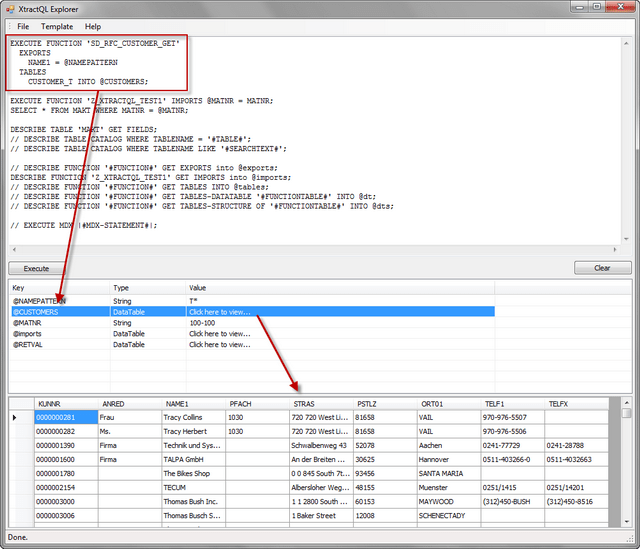 The runtime allows retrieving data directly from SAP tables. The ERPConnectServiceClient class provides a method called ExecuteTableQuery with two overrides which query SAP tables in a simple way. The method also supports a way to pass miscellaneous parameters like row count and skip, custom function, where clause definition and a returning field list. These parameters can be defined by using the ExecuteTableQuerySettings class instance. The first query reads all records from the SAP table T001 where the fields ORT01 equals Paris and LAND1 equals FR (France). The query returns the top 100 records and the result set contains only the fields BUKRS, BUTXT, ORT01 and LAND1. The second query returns the top ten records of the SAP table MAKT, where the field MATNR equals the material number 60-100C. The result set is ordered by the field SPRAS. In addition to query SAP tables the runtime API executes SAP function modules (BAPIs). Function modules must be marked as remote-enabled modules (RFC) within SAP. The ERPConnectServiceClient class provides a method called CreateFunction to create a structure of metadata for the function module. The method returns an instance of the data structure ERPFunction. This object instance contains all parameters types (import, export, changing and tables) that can be used with function modules. The following code shows an additional sample. Before we can execute this function module we need to define a table with HR data as input parameter. The ECS runtime is offering a SAP query language called XtractQL. The XtractQL query language, also known as XQL, consists of ABAP and SQL syntax elements. 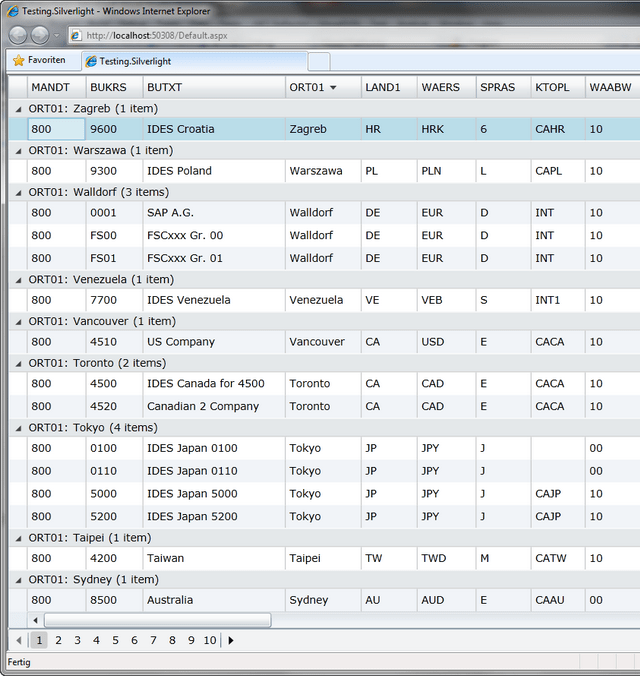 XtractQL allows querying SAP tables, BW-Cubes, SAP Queries and executing function modules. This statement executes the SAP Query “S|ZTHEO02|ZLIKP” (name includes the workspace, user group and the query name). As you can see XtractQL extends the SQL syntax with ABAP or SAP specific syntax elements. This way you can define fields using the LIPS-MATNR format and SAP-like where clauses like “SP$00002 BT ‘0080011000’AND ‘0080011999’”. ERPConnect Services provides a little helper tool, the XtractQL Explorer (see screenshot below), to learn more about the query language and to test XQL queries. You can use this tool independent of SharePoint, but you need access to a SAP system. So far all samples are using the assembly ERPConnectServices.Server.Common.dll as project reference and all code snippets shown run within the SharePoint context, e.g. Web Part. In Silverlight the implementation and design pattern is a little bit more complicated, since all web services will be called in asynchronously. It’s also not possible to use the DataTable class. It’s just not implemented for Silverlight. The runtime provides a similar class called ERPDataTable, which is used in this cases by the API. The ERPConnectServiceClient class for Silverlight provides the method ExecuteTableQueryAsync and an event called ExecuteTableQueryCompleted as callback delegate. The following code sample shows a simple query of the SAP table T001 within a Silverlight client. First of all, an instance of the ERPConnectServiceClient is created using the URI of the ERPConnectService.svc, then a delegate is defined to handle the complete callback. Next, the query is executed, defined with a RowCount equal 10 to only return the top 10 records in the result set. Once the result is returned the data set will be attached to a DataGrid control (see screenshot below) within the callback method. 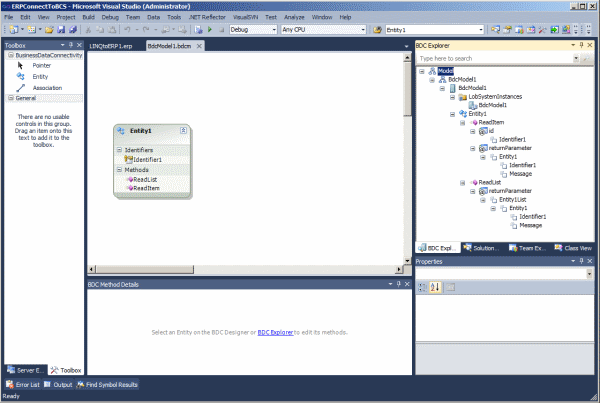 ERPConnect Services includes a Visual Studio 2010 plugin, the ECS Designer, that allows developer to visually design SAP interfaces. It’s working similar to the LINQ to SAP Designer I have written about a while ago, see article at CodeProject: LINQ to SAP. The ECS Designer is not automatically installed once you install the product. You need to call the installation program manually. The setup adds a new project item type to Visual Studio 2010 with the file extension .ecs and is linking it with the designer. The needed references are added automatically after adding an ECS project item. The designer generates source code to integrate with the ERPConnect Services runtime after the project item is saved. The generated context class contains methods and sub-classes that represent the defined SAP objects (see screenshots below). The screenshot above for instance shows the tables dialog. 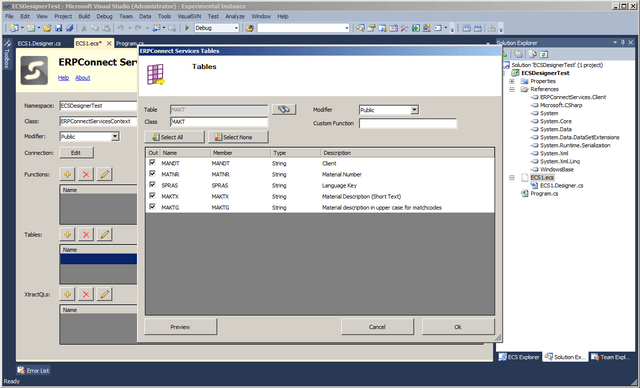 After clicking the Add (+) button in the main designer screen and searching a SAP table in the search dialog, the designer opens the tables dialog. In this dialog you can change the name of the generated class, the class modifier and all needed properties (fields) the final class should contain. Using the generated code is simple. 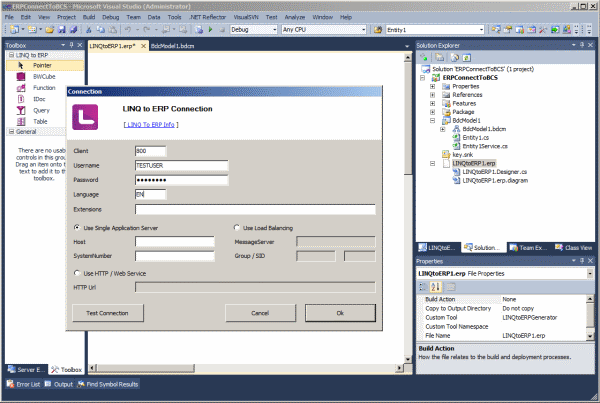 The project type we are using for this sample is a standard console application, therefore the designer is referencing the ERPConnectServices.Client.dll for desktop applications. 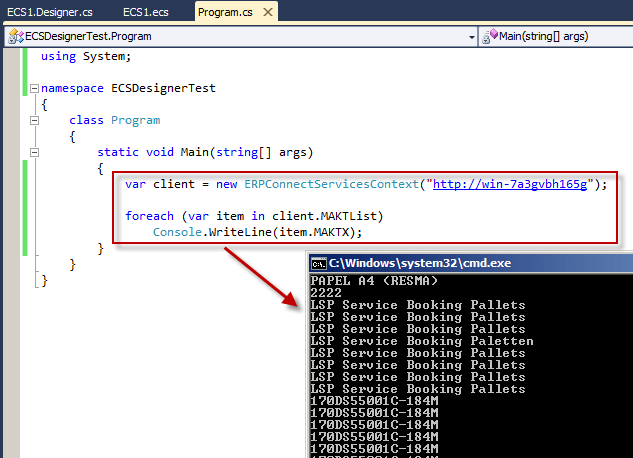 Since we are not within the SharePoint context, we have to define the URI of the SharePoint system by passing this value into the constructor of the ERPConnectServicesContext class. The designer has generated class MAKT and an access property MAKTList for the context class of the table MAKT. The type of this property MAKTList is ERPTableQuery<MAKT>, which is a LINQ queryable data type. This means you can use LINQ statements to define the underlying query. Internally, the ERPTableQuery<T> type will translate your LINQ query into call of ExecuteTableQuery. The runtime is not providing direct access to the underlying SAP connection, but the library offers a mechanism called connection scoping. You may create a new connection scope with the client library and telling ECS to use the same SAP connection until you close the connection scope. Within the connection scope every library call will use the same SAP connection. In order to create a new connection scope you need to call the BeginConnectionScope method of the class ERPConnectServiceClient. The method returns an IDisposable object, which can be used in conjunction with the using statement of C# to end the connection scope. Alternatively, you may call the EndConnectionScope method. It’s also possible to use function modules with nested structures as parameters. This is a special construct of SAP. The goods receipt sample above is using a nested structure for the export parameter GOODSMVT_CODE. For more detailed information about nested structures and tables see the product documentation. Microsoft and SAP are jointly delivering business intelligence (BI) interoperability in Microsoft Excel, Microsoft Power BI for Office 365, and SAP BusinessObjects BI. Microsoft Power Query for Excel seamlessly connects to SAP BusinessObjects BI Universes enabling users to access and analyze data across the enterprise and share their data and insights through Power BI. This connectivity drives a single version of truth, instant productivity, and optimized business performance for your organization. Preview contains SAP BusinessObjects BI Universe connectivity. Microsoft Power Query Preview for Excel, providing SAP BusinessObjects BI Universe connectivity, is an add-in that provides a seamless experience for data discovery, data transformation and enrichment for Information Workers, BI professionals and other Excel users. This preview provides an early look into the upcoming SAP BusinessObjects BI Universe connectivity feature. As with most previews, this feature may appear differently in the final product. Microsoft Power Query Preview for Excel requires Internet Explorer 9 or greater. Microsoft Power Query Preview for Excel is available for 32-bit (x86) and 64-bit (x64) platforms, your selection must match architecture of the installed version of Office. Learn how Microsoft and SAP deliver a combination of trusted enterprise data and familiar market leading tools. Deliver the latest, accurate and trusted data from across the enterprise, such as from SAP applications, directly into the hands of users in Microsoft Excel. They no longer need to constantly copy and paste or import data using a manual process leading to inaccuracy. Users can instead focus on leveraging their knowledge to analyze data from within and outside your organization. They can get answers and uncover new insights to better deal with the challenges facing your organization, eliminating costly decisions based on inaccurate data. Users can continue to work in their familiar Microsoft Excel environment with access to business friendly terms from SAP BusinessObjects BI Universes at their fingertips, allowing for deeper analysis on their own. Using familiar tools enables them to easily integrate data and insights into existing workflows without the need to learn new complex tools and skills. Any uncovered data and insights can be kept up to date with no hassle refreshing from on-premises and the cloud, increasing productivity. Leveraging existing investments from both companies together enables your organization to unlock insights faster and react accordingly. Your organization can identify patterns, cost drivers, and opportunities for savings in an agile, accurate, and visual manner. Specific trends and goals can be measured while having visually attractive and up to date dashboards. Relying on trusted enterprise data reduces costs and increases profitability by allowing faster, better, and timelier decisions. All of this drives broader BI adoption to create an information driven culture across your organization. Drive trusted enterprise data and insights from an SAP BusinessObjects BI Universe throughout your organization by sharing and collaborating with Power BI from anywhere. Anyone can create a collaborative BI site to share data and insights relying on the latest data from either on-premises or the cloud using scheduled refreshing. Users no longer have to struggle to think up and answer every single question in advance, instead interactively investigating data when they need it through natural language Q&A. Better yet, they can stay connected with mobile access to data and insights generating a deeper understanding of the business and communicating more effectively from anywhere. Here are the condensed steps that I use on the client when troubleshooting issues related to taking Duet Enterprise lists offline. NOTE: You must be an Administrator on the computer to use the tracing. 7. Next to the Providers box, click the “Add…” button and wait for the list to load. 10. You should now see your “BCS” Data Collector Set listed under “User Defined” in Perfmon. 1. Select the “BCS” data collector set you created previously. 2. Click the “Start the Data Collector Set” button. 4. Click the “Stop the Data Collector Set” button to stop the trace. 3. In the “Open Saved Log” dialog, navigate to the .etl trace file you created earlier and choose Open. 4. When prompted to convert to the new event log format choose Yes. 6. You should see the trace information in event viewer. An important new mantra is search-driven applications. In fact, “search” is the new way of navigating through your information. In many organizations an important part of the business data is stored in SAP business suites. A frequently asked need is to navigate through the business data stored in SAP, via a user-friendly and intuitive application context. For many organizations (78% according to Microsoft numbers), SharePoint is the basis for the integrated employee environment. Starting with SharePoint 2010, FAST Enterprise Search Platform (FAST ESP) is part of the SharePoint platform. All analyst firms assess FAST ESP as a leader in their scorecards for Enterprise Search technology. For organizations that have SAP and Microsoft SharePoint administrations in their infrastructure, the FAST search engine provides opportunities that one should not miss. Search is one of the supporting pillars in SharePoint. And an extremely important one, for realizing the SharePoint proposition of an information hub plus collaboration workplace. 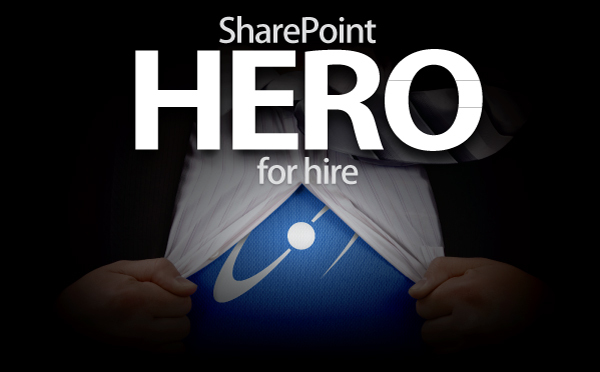 It is essential that information you put into SharePoint, is easy to be found again. By yourself of course, but especially by your colleagues. However, from the context of ‘central information hub’, more is needed. You must also find and review via the SharePoint workplace the data that is administrated outside SharePoint. Examples are the business data stored in Lines-of-Business systems [SAP, Oracle, Microsoft Dynamics], but also data stored on network shares. With the purchase of FAST ESP, Microsoft’s search power of the SharePoint platform sharply increased. All analyst firms consider FAST, along with competitors Autonomy and Google Search Appliance as ‘best in class’ for enterprise search technology. For example, Gartner positioned FAST as leader in the Magic Quadrant for Enterprise Search, just above Autonomy. In SharePoint 2010 context FAST is introduced as a standalone extension to the Enterprise Edition, parallel to SharePoint Enterprise Search. 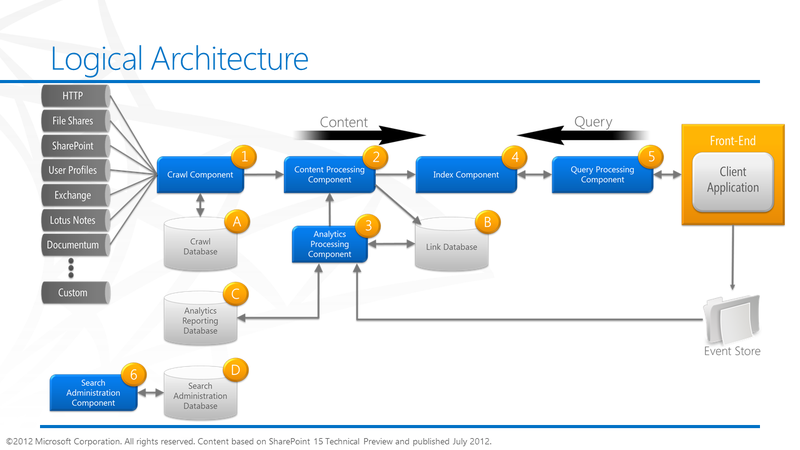 In SharePoint 2013, Microsoft has simplified the architecture. FAST and Enterprise Search are merged, and FAST is integrated into the standard Enterprise edition and license. Execute Search Queries against the accumulated index-administration, and expose the search result to the user. In the indexation step, SharePoint FAST must thus retrieve the data from each of the linked systems. FAST Search supports this via the connector framework. There are standard connectors for (web)service invocation and for database queries. And it is supported to custom-build a .NET connector for other ways of unlocking external system, and then ‘plug-in’ this connector in the search indexation pipeline. Examples of such are connecting to SAP via RFC, or ‘quick-and-dirty’ integration access into an own internal build system. In this context of search (or better: find) in SAP data, SharePoint FAST supports the indexation process via Business Connectivity Services for connecting to the SAP business system from SharePoint environment and retrieve the business data. What still needs to be arranged is the runtime interoperability with the SAP landscape, authentication, authorization and monitoring. An option is to build these typical plumping aspects in a custom .NET connector. But this not an easy matter. And more significant, it is something that nowadays end-user organizations do no longer aim to do themselves, due the involved development and maintenance costs. An alternative is to apply Duet Enterprise for the plumbing aspects listed. Combined with SharePoint FAST, Duet Enterprise plays a role in 2 manners: (1) First upon content indexing, for the connectivity to the SAP system to retrieve the data. The SAP data is then available within the SharePoint environment (stored in the FAST index files). Search query execution next happens outside of (a link into) SAP. (2) Optional you’ll go from the SharePoint application back to SAP if the use case requires that more detail will be exposed per SAP entity selected from the search result. An example is a situation where it is absolutely necessary to show the actual status. As with a product in warehouse, how many orders have been placed? 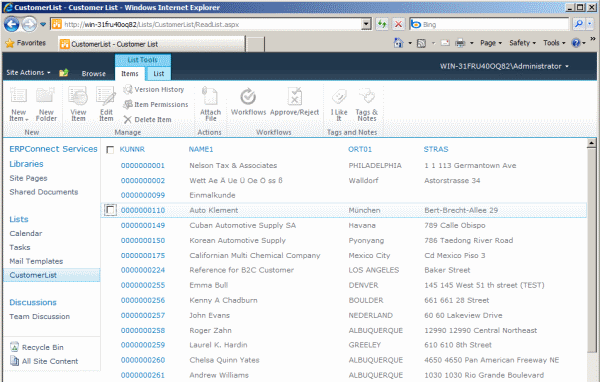 Duet Enterprise retrieves data under the SAP account of the individual SharePoint user. This ensures that also from the SharePoint application you can only view those SAP data entities whereto you have the rights according the SAP authorization model. The retrieval of detail data is thus only allowed if you are in the SAP system itself allowed to see that data. Due the FAST architecture, matters are different with search query execution. I mentioned that the SAP data is then already brought into the SharePoint context, there is no runtime link necessary into SAP system to execute the query. Consequence is that the Duet Enterprise is in this context not by default applied. In many cases this is fine (for instance in the customer example described below), in other cases it is absolutely mandatory to respect also on moment of query execution the specific SAP permissions. The FAST search architecture provides support for this by enabling you to augment the indexed SAP data with the SAP autorisations as metadata. To do this, you extend the scope of the FAST indexing process with retrieval of SAP permissions per data entity. This meta information is used for compiling ACL lists per data entity. FAST query execution processes this ACL meta-information, and checks each item in the search result whether it allowed to expose to this SharePoint [SAP] user. This approach of assembling the ACL information is a static timestamp of the SAP authorizations at the time of executing the FAST indexing process. In case the SAP authorizations are dynamic, this is not sufficient. For such situation it is required that at the time of FAST query execution, it can dynamically retrieve the SAP authorizations that then apply. The FAST framework offers an option to achieve this. It does require custom code, but this is next plugged in the standard FAST processing pipeline. SharePoint FAST combined with Duet Enterprise so provides standard support and multiple options for implementing SAP security trimming. And in the typical cases the standard support is sufficient. The above is not only theory, we actually applied it in real practice. The context was that of opening up of SAP Enterprise Learning functionality to operation by the employees from their familiar SharePoint-based intranet. One of the use cases is that the employee searches in the course catalog for a suitable training. This is a striking example of search-driven application. You want a classified list of available courses, through refinement zoom to relevant training, and per applied classification and refinement see how much trainings are available. And of course you also always want the ability to freely search in the complete texts of the courses. In the solution direction we make the SAP data via Duet Enterprise available for FAST indexation. Duet Enterprise here takes care of the connectivity, Single Sign-On, and the feed into SharePoint BCS. From there FAST takes over. Indexation of the exposed SAP data is done via the standard FAST index pipeline, searching and displaying the search results found via standard FAST query execution and display functionalities. In this application context, specific user authorization per SAP course elements does not apply. Every employee is allowed to find and review all training data. As result we could suffice with the standard application of FAST and Duet Enterprise, without the need for additional customization. Microsoft SharePoint Enterprise Search and FAST both are a very powerful tool to make the SAP business data (and other Line of Business administrations) accessible. The rich feature set of FAST ESP thereby makes it possible to offer your employees an intuitive search-driven user experience to the SAP data. Most organizations have several systems holding their data. Data from these systems must be indexable and made available for search on the common Internal Search portal. While most of the different data silos are able to dump or export their full dataset as XML, SharePoint does not include an OOTB general purpose XML indexing connector. The SharePoint Server Search Connector Framework is known to be overly complex, and documentation out there about this subject is very limited. There are basically two types of custom search connectors for SharePoint 2010 that can be implemented; the .Net Assembly Connector and the Custom Connector. More details about the differences between them can be found here. Mainly, a Custom Connector is agnostic of external content types, whereas each .NET Assembly Connector is specific to one external content type, and whenever the external content type changes, the .Net Assembly Connector must be re-compiled and re-deployed. If the entity model of the external system is dynamic and is large scale a Custom Connector should be considered over the .Net Assembly Connector. Also, a Custom Connector provides administration user interface integration, but a .NET Assembly Connector does not. The XML File Indexing Connector that is presented here is a custom search indexing connector that can be used to crawl and index XML files. In this series of posts I am going to first show you how to install, setup and configure the connector. In future posts I will go into more implementation details where we’ll look into code to see how the connector is implemented and how you can customize it to suit specific needs. Open the SharePoint 2010 Management Shell on the application server. At the command prompt, type the following command to get a reference to your FAST Content SSA. Note that the Propset GUID must be the one specified above, since this GUID is hardcoded in the Connector code as the Crawled Properties Category which will receive discovered Crawled Properties. Using the Central Administration UI, on the Search Administration Page of the FAST Content SSA, click Content Sources, then New Content Source. Type a name for the content source, and in Content Source Type, select Custom Repository. In Type of Repository select xmldoc. The following section describes the different parts of the Start Address. The Start Address specified for the Content Source must be of the following format. The XML File Connector will read this Start Address and use them when crawling the XML content. xmldoc is the protocol corresponding to the registry key we added when installing the connector. //hostname/folder_path/ is the full path to the folder conaining the XML files to crawl. Defines which elements in the XML file to use as document and identifier elements. This configuration parameter is mandatory. titleelm=title defines which element in the XML file to use as the Title. This will end up as the Title of the document, and the value of this element will go into the title managed property. This configuration parameter can be left out. If the parameter is left out, then the title of the document will be set to ”notitle”. The XML File Connector uses advanced BCS techniques to automatically Discover crawled properties from the content of the XML files. All elements in the XML docuemt will be created as crawled properties. This provides the ability to dynamically crawl any XML file, without the need to pre-define the properties of the entities in the BCS Model file, and re-deploy the model file for each change. This is defined in the BCS Model file on the XML Document entity. The TypeDescriptor element named DocumentProperties, defines an list of dynamic property names and values. The property names in this list will automatically be discovered by the BCS framework and corresponding crawled properties will automatically be created for each property. In addition to the ability to discover crawled properties automatically from the XML content, the XMl File Connector also creates a default property with the name “XMLContent”. This property contains the raw XML of the document being processed. This enables the use of the XML content in a custom Pipeline extensibility stage for further processing. Say that we have the following XML file to index. When running the connector the first time; we see the following Crawled Properties discovered in the Custom XML Connector Crawled Properties Category. The BCS Search Connector Framework is implemented in such a way that keeps track of all crawled content in the Crawl Log Database. For each search Content Source, a log of all document ids that have been crawled is stored. This log is used when running subsequent crawls of the content source, be it either a full or an incremental crawl. When running an incremental crawl, the BCS framework compares the list of document ids it received from the connector against the list of ids stored in the crawl log database. If there are any document ids within the crawl log database that have not not been received from the connector, the BCS framework assumes that these documents have been deleted, and will attemp to issue deletion operations to the search system. This will cause many inconsistencies, and will make it very difficult to keep both the actual dataset and the BCS crawl log in sync. So, when running either a Full Crawl or an Incremental Crawl of the Content Source, the full dataset of the XML files must be available for traversal. If there are any items missing in subsequent crawls, the SharePoint crawler will consider those as subject for deletion, and og ahead and delete those from the search index. One possible work around to tackle this limitation and try to avoid (re)-generating the full data set each time something minor changes, would be to split the XML content into files of different known update frequences, where content that is known to have higher update rates is placed in separate input folders with separate configured Conetent Sources within the FAST Content SSA. When the XML File Connector starts crawling content, it will load and parse found XML files one at the time. So, for each XML file found in the input directory, the whole XML file is read into memory and cached for all subsequent operations by the crawler until all items found in the XML file have been submitted to the indexing subsystem. In that case, the memory cache is cleared, and the next file is loaded and parsed until all files have been processed. For the reason just described, it is recommended not to have large single XML files, but split the content across multiple XML files, each consisting of a number of items the is reasonable and can be easily parsed and cached in memory. Contact me at tomas.floyd to find out more about this Connector and other custom developed SharePoint and Office 365 Web Parts and Apps!! This tool helps you understand and learn how the available parameters on the Search REST service should be formatted. Issue HTTP GET or POST search queries. See how the different Query parameters are formatted. Authenticate using different users to debug security trimming issues. Use against your tenant on SharePoint Online and authenticate using your SPO User ID. Application definition import failed. The following error occurred: Error loading url: “http://&#8230;.”. This normally happens when url does not point to a valid discovery document, or XSD schema. Using Fiddler I detected that the problem cause is a “(407) Proxy Authentication Required” issue: “The ISA server requires authorization to fulfill the request. Access to proxy filter is denied.” Although I did setup a rule in Windows CredentialsManager for automatic authentication against the web proxy, this is not picked up in the context of BCS service application as an autonomous running process. As it turns out, by default .NET web applications and services will attempt to use a proxy, even if it doesn’t need one. Disable usage of (default)proxy altogether for the BCS application process. This is a viable approach in case the consumed external systems are all within the internal company network infra. Disable usage of (default)proxy for specific addresses for the BCS application process. Disable usage of proxy for specific address on system level. This is in fact the most simple approach, just disable proxy usage for certain url’s for all processes on system level. That is also the potential disadvantage, it can be that it is not allowed to disable proxy usage for all processes. You disable the proxy via IE \ Internet Options \ Connections \ LAN Settings \ Advanced \ Proxy Server \ Exception <Do not use proxy server for addresses beginning with>. Note The Connect to Outlook option in a SharePoint 2010 site only enables you to take the list data in a workspace offline, and not task panes and actions. Note If you are unsure of the location or the name of the file, contact your server administrator. Note If the Site collection features option does not appear, then click Go to top level settings option under Site Collection Administration. The Site Collection Features option will now appear. Note If you are unsure of what files to use or where they are located, contact your server administrator. Note If you do not see any task panes listed, it might mean that your site administrator has not uploaded the task pane files to the site collection. Contact your site administrator. Note If you do not see any actions listed, it might mean that your site administrator has not uploaded the action files to the site collection. Contact your site administrator. Note If the OK button is not available, it means that the farm administrator has not uploaded the necessary certificates to the Trusted Publishers and Trusted Root Certification Authorities stores in the farm. Contact your server administrator for further assistance. The Business Connectivity Services (BCS) Solution Packaging Tool is intended for Power Users and Developers of Microsoft Business Connectivity Services solutions. This tool includes a help file. A sample solution has been added to the Downloads page (click “Sample Solution” in the Releases navigation at the right side of the page). The tool now has an option to validate the artifacts and their connections before packaging. This option is on by default, but can be turned off to speed up the packaging process.